Faculty180 has gotten a facelift! 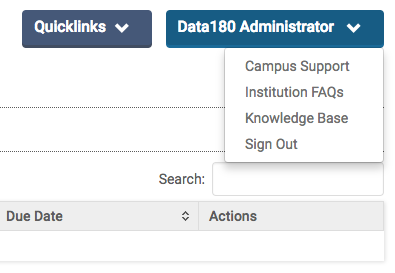 Today we launched a cosmetic visual update to the Faculty180 user interface: colors, fonts, and logos. The new look and feel maintains web accessibility standards (WCAG) and is equivalent to the previous version in terms of known accessibility requirements. The user’s name no longer appears in the upper left (“Welcome Scott K. Harris”). Instead, it appears in the upper right as a dropdown menu button. For clients using institutional branding (logo): Instead of displaying the Faculty180 logo in the upper left and the client’s logo in the upper right, we will simply display the client’s logo in the upper left instead of the Faculty180 logo. For clients not using institutional branding: In the upper left, the green Faculty180 logo has been replaced by the new “Interfolio Faculty180” logo. In the lower left, instead of “Powered by Data180 / An Interfolio Company,” it just says, “Powered by Interfolio”. We have switched the default in-product color scheme from the previous green to a dark blue. We have switched the in-product font to match that in the other Interfolio products. 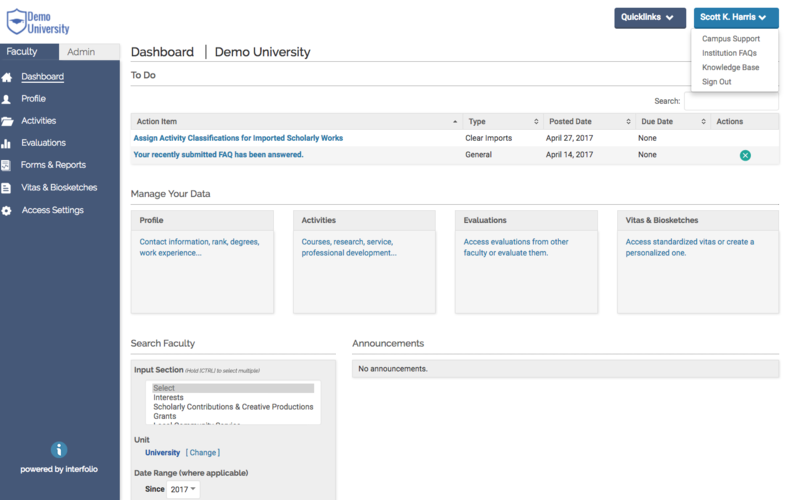 Interfolio is working toward an integrated, flexible faculty information system that will offer a more continuous user experience between all of our products. The Faculty180 product is now visually in line with the other Interfolio products to reduce confusion for users down the road.